Blades much like the Havall Viking Seax served as a common sidearm to the Germanic and Anglo-Saxon tribes from the Migration Period to the Early Middle Ages. This decorative weapon adds authenticity to the role of Viking raider. The knife possesses a long, broken-back blade, forged from steel. Brass pins secure a wooden hilt with round crossguard to the tang of the blade. 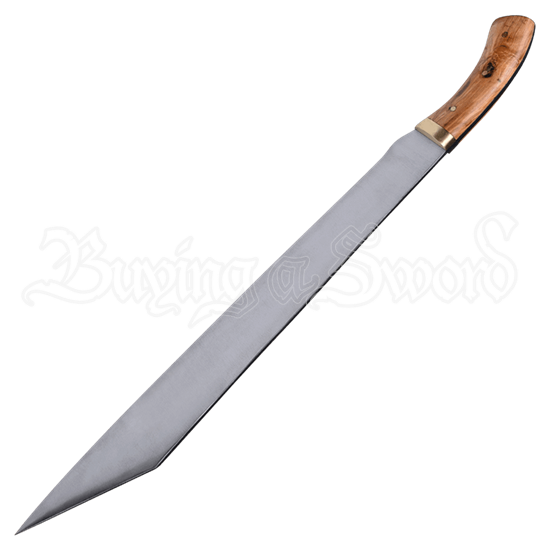 With its simple, traditional design, the Havall Viking Seax Sword is a perfect accessory to a historical appearance. Please be aware that the blade arrives only partially sharpened. This dagger is not intended for stage fighting, but for costume and decorative purposes only. This item is handmade, therefore, it may vary slightly from what is shown above.